Note 9 talked, in part, about how God needs us! He needs us to recognize our worth and value to Him and our significance to His end-times plan. He also needs us to love Him with all our heart, soul, mind, and strength, to seek Him diligently, and to truly know Him and His Word. These are all important parts of helping us discover the unique place and purpose for which we were created, and for helping us fulfill our roles as His Body, SALT, Light, and PILLARS. A few months ago He said, “NOW is the time to pray.” While I believe that referred to the urgent need for intercession right now over all that’s going on in the nation(s), I also believe He was indicating that we’re in a critical season for His people to seek Him and find our purpose, place, and the next steps to fulfilling our life assignments. In November, I posted about how the Lord had been emphasizing the brevity of life several months earlier and the necessity, therefore, of being focused on fulfilling our assignments. He had been showing us that this was not only a message He was giving us personally, but that many others in the body were receiving the same word, leading us to believe He’s indicating that the remaining time is brief for all of us collectively (post from November). Recently, these kinds of words have been precisely confirmed again. Those who have been in the process of preparation and have stood before the Lord saying, “Here am I; send me,” may now find ourselves on the receiving end of that prayer, among those He is thrusting out into the harvest. Some of us may already know the BIG PICTURE of what He’s called us to accomplish, but have no idea how to fill in the details to get from here to there. Others may not even know what the overall picture is. But no matter where we are in the discovery process of His purpose and plan for our lives, He longs to reveal the answers we need. As we draw close to Him, He promises to draw close to us. Through our intimate relationship with Him, He can unveil His divine destiny for our lives, imparting His vision and His plan for fulfilling it. As we continually seek Him, He can give us staggering prophetic promises, life-altering instructions, confirmations that we’re on the right track, course corrections when we’re off track, power to persevere, strength to overcome, adjustments to our character necessary to advance, admonition to stay somewhere we want to leave, prodding to leave somewhere we want to stay, a long term mission, a short term strategy, a divine instruction for a giant leap of faith, or a gentle nudge for a nearly imperceptible step. But whatever He needs to reveal to us along the way, we don’t want to miss it! His people needlessly perish for lack of knowledge while ALL the treasures of wisdom and knowledge are hidden in Him, awaiting our discovery (Hosea 4:6, Colossians 2:2-3). He has given us the astounding gift of direct access into His Presence. He has every answer we need! He IS every answer we need! Thank God He did not leave us as spiritual orphans to fend for ourselves or figure things out on our own. He has given us His Word and His Spirit to be with us and in us, to teach us His ways and His will, to guide us into all Truth, to remind us of everything He’s spoken, to counsel us, instruct us, coach, train, and mentor us. He wants to give us wise and discerning hearts which do not make decisions/judgments based on our natural senses, but according to what He reveals by His Spirit. He wants to help us successfully navigate around every trap and snare of the enemy and enable us to reach our destination as quickly and safely as possible. He wants to reveal the proper time and procedure for every matter (His will, plan, and timing – the What, When, and How – we don’t necessarily get to know the WHY). He even wants to tell us about the future and show us what to do. – and His incomparably great POWER for us who believe. He wants to open our spiritual eyes to see, ears to hear, hearts to perceive, believe, and receive, and our minds to understand all that He’s speaking to us. He wants to manifest Himself to us, teach us everything we need to know, and make all things clear (Psalm 25:12-14; 32:8, Eccles 8:5-6, I Kings 3:7-13, I Chronicles 12:32, Isaiah 11:1-4, Luke 24:45, John 4:25-26; 14-16, Ephesians 1:16-20, Philippians 3:15-16, Colossians 2:2-3, etc.). When He has made such astounding provision for us to know Him and His will for our lives in such intimate detail, we should not settle for living beneath it. Our part is to seek Him with all our hearts. 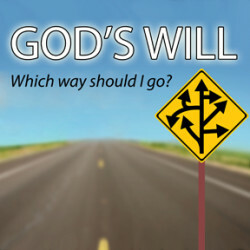 He calls us to earnestly and diligently (not casually) seek Him (Hebrews 11:6). His sheep, those who belong to Him, can come to know Him and His voice well enough to discern it from every other. This degree of familiarity and intimacy is not automatic, but is cultivated through spending time together with Him (through His Word and Spirit). He promises His sheep will come to the place of being able to discern and flee from the voice of the enemy, but to recognize and follow Him (John 8:47; John 10). Waiting on Him does not imply passivity, but patient and persistent pursuit. It’s an active posture of seeking while waiting in confident expectation for Him to pour out His wisdom and make things clear as He’s promised to do (James 1:5). Many times as we seek, God gives bits and pieces. He does this, in part, to continue to draw us into deeper dimensions of seeking. We can imagine this process like putting a puzzle together. Because we understand the process, we do not get upset or frustrated that one piece does not reveal the entire picture, or that even multiple pieces put together are still only revealing the picture in part. We realize that each piece will only contain partial revelation of the whole, and that as we keep seeking and putting those pieces together we will eventually see the entire picture clearly. Unfortunately, those who do not understand this process may get frustrated that often their questions seem to lead to more questions instead of clear answers right away, and may give up thinking they can’t hear God or that the process is too complicated/confusing. God hides the treasures of His revelations for us, to be discovered as we continue digging and pressing in to Him. Our perseverance in pursuit reveals how much we want to uncover His will and plan (our priorities, our hunger/passion/desire for Him and His will, etc.). 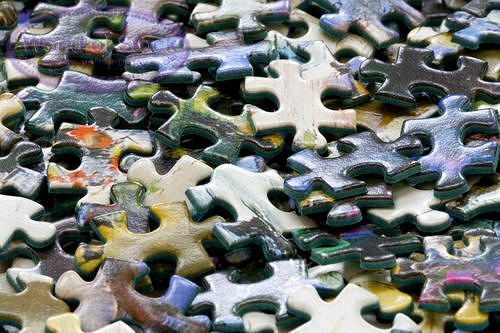 If you force pieces of the puzzle into place, other pieces will not fit. If you leave pieces of the puzzle out, the picture will be incomplete. “It is not good to have zeal without knowledge, nor to be hasty and miss the way.” (Prov 19:2) LORD, teach us the RIGHT questions to ask, and help us RECEIVE the answers YOU give! If the answers you need aren’t evident right away, keep seeking until they are crystal clear. God’s drawing you into deeper intimacy. You might just be after answers, but He’s after relationship. This entry was posted in Holy Spirit, Prophecy/Teaching, Provision.